Located on Newfound Lake, New Hampshire, Camp Wicosuta has been a girls camp for over 90 years and was founded by a visionary woman to foster leadership skills in young women. The camp provides excellent facilities, indoor lodging, camping, and a lovely sandy beach on the lake for swimming and sunning. 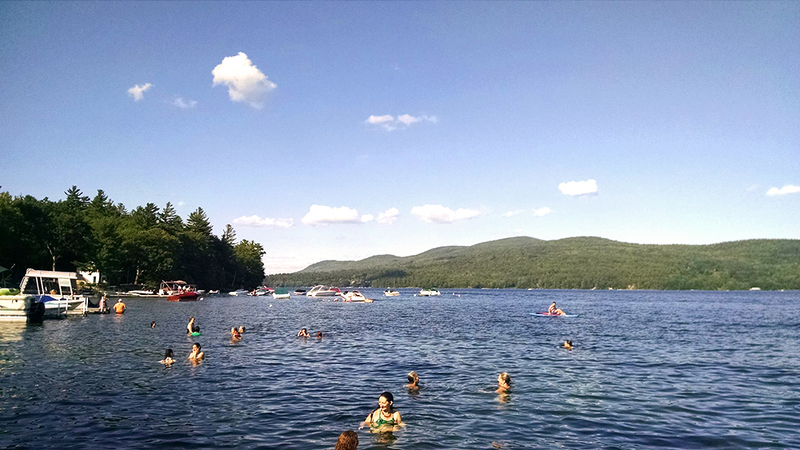 Camp Wicosuta is beautifully situated on the west shore of Newfound Lake, one and one-half miles from Hebron Center, seven miles from Bristol and twelve miles from Plymouth, New Hampshire. Interstate highways provide easy access to the Camp Wicosuta area. Camp Wicosuta’s address (21 Wicosuta Drive) is often not recognized by GPS or Mapquest. Instead, use the following address: 100 West Shore Road. That will bring you to within a mile of camp. Once you “arrive” follow signs to Camp Wicosuta. Take 1-95 North (New England Thruway) to Exit 48. Take I-91 North towards Hartford. Take Exit 29 near Hartford onto Route 84 East towards Boston. (As an alternate from NYC, you can take the Hutchinson River Parkway North to 684 North to 84 East through Hartford or the Hutchinson River Parkway North to the Merritt Parkway to I-91 North). Take I-84 East to the Mass Pike East (I-90 East). Take the Mass Pike to I-290 East to 495 North to Route 3 towards Lowell/Nashua, NH. Take Route 3 to I-93 North to Exit 23. Turn left onto Route 104 towards Bristol. *Continue with the directions below. Bear right on 3A North. Go straight through traffic light to the yellow blinking light (church on the corner). Turn left onto West Shore Road (Wellington State Park). Go 1-1/4 miles. Make a right continuing on West Shore Road (1/4 mile past Shackett’s Supermarket), continue until you see the Camp Wicosuta Main Entrance sign on the left. Take I-93 North to Exit 23 in New Hampshire. Turn left onto Route 104 to Bristol. *Follow above directions from Bristol. Save Money. Make Friends. Conserve Energy. If you can give a ride or share a ride, visit our group carpool sign up sheet—thank you! If flying in, the nearest airport is Manchester, NH (1 1/2 hrs). Logan International in Boston is 2 hours from Hebron, but may provide better and less expensive flights. Van service is expensive, so please ride share or plan to rent a car. Burlington International Airport is approximately 2 ½ hours.